When 21-year old Tim gets released from a mental institution – thirteen years after he was convicted for committing a murder – his sister awaits him, eager to kill what in her opinion was responsible for everything: A mirror. 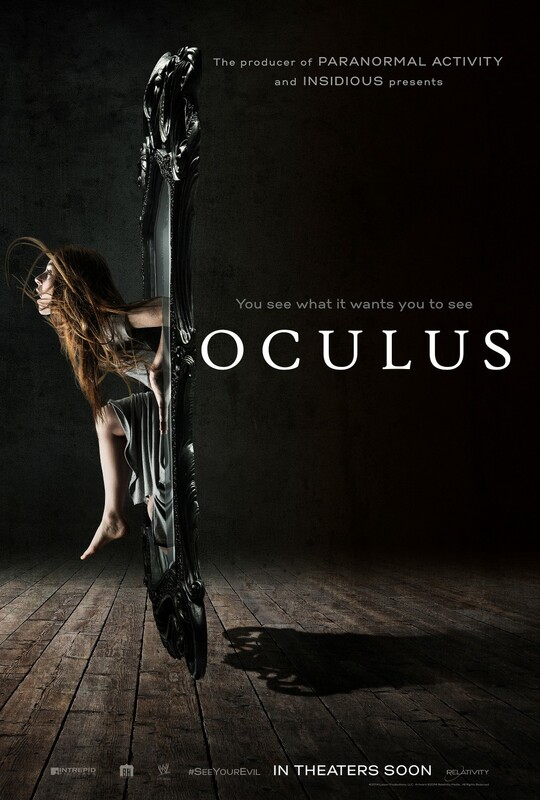 I have only seen the 1- minute teaser of Oculus and refused to see the full length trailer since I think trailers are still giving too much away these days. As it turned out, I was right. The teaser was full of suspense and I didn’t really catch on the whole storyline, so I was quite intrigued when watching the movie this weekend. It left the audience with too many questions, which would be okay if the essential question of why the mirror was there in the first place could have been answered, but unfortunately that wasn’t the case. It felt like a copout and not creative: kind of like the Paranormal Activity movies, but that’s not a surprise since it was from the same producer. The Cast was very convincing and especially young Kaylie (Annalise Basso) was doing a terrific job. Even though it had some major flaws in the beginning and especially the end, I would probably watch it again for the good actors and the nice plot and suspense development in the middle. However, if I want to see a supernatural thriller that has everything including a great ending, I would rather go with movies like The Skeleton Key or Fallen. #TVThursday : Revenge (2009- ) – A Roller Coaster I want to get off From… And the Ride used to be so Much Fun! Pingback: #TvTuesday : Selfie (2014- ) – Too literal or just right? (Watch Pilot for free!!) | Simon Says... WATCH THIS! A fun horror movie. Maybe more fun than actually scary, but hey, I can’t complain too much when I’m being entertained. Good review. Thanks sir, I have to say I wanted to know at the end. That is usually good, but in that case I felt cheated. I’ve read such mixed reviews of this. Still not sure if I’ll see it. I’m not much of a horror fan.